Need a new place to chill? How about a form-fitting memory foam chair that's big enough to share? Introducing the Chill Sack. 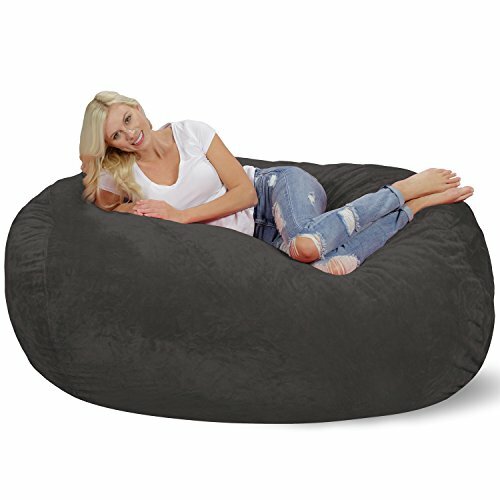 Add some fun to your basement hangout, dorm room, or bedroom with this super comfy bean bag chair! The 6 foot Chill Sack Lounger is ideal for kids, teenagers, college students, and stressed out adults. Use it while watching your favorite movies, tv shows, or while playing your favorite game. Chill Sack is the ideal bean bag sofa for snuggles and cuddles, whether that's with your special someone, dog or favorite blanket. The bean bag measures 72” x 48” x 34" and is just the right size for relaxing in any room: large enough to watch a movie with your best friends and ultimate spot for Netflix binge watching. Bounce back with comfort! Each bean bag chair is stuffed with a shredded, soft, memory foam blend that is highly durable so you can flop and fall on it all you want and it will never lose its shape. Covered in a soft micro fiber material, the Chill Sack offers ultimate comfort and unmatched functionality. The removable cover can be machine washed and is resistant to stains, and discoloration so your new favorite lounger always looks and feels brand new. Every Chill Sack has double stitched seams for extra strength and extended use. Chill Sacks are proudly made right here at home in the USA with high quality, light and fluffy, shredded foam, premium zippers, and hand selected fabrics that are double stitched for maximum strength and durability. - Dimensions: 72” x 48” x 34"
If you have any questions about this product by Chill Sack, contact us by completing and submitting the form below. If you are looking for a specif part number, please include it with your message.